When I look at Starbucks coffee cups, I think of, well, Starbucks coffee. When artist Soo Min Kim looks at them, he sees something else entirely. 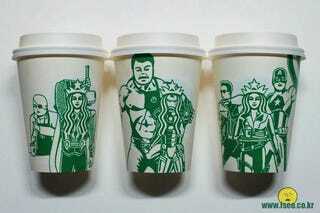 For the past few years, Kim has been drawing on Starbucks coffee cups, turning them into works of art. During this time, his Starbucks cups have gotten more elaborate and more creative. Below, you can see some of Kim's work from his Facebook page. Be sure to check out Kim's official site for more Starbucks art.